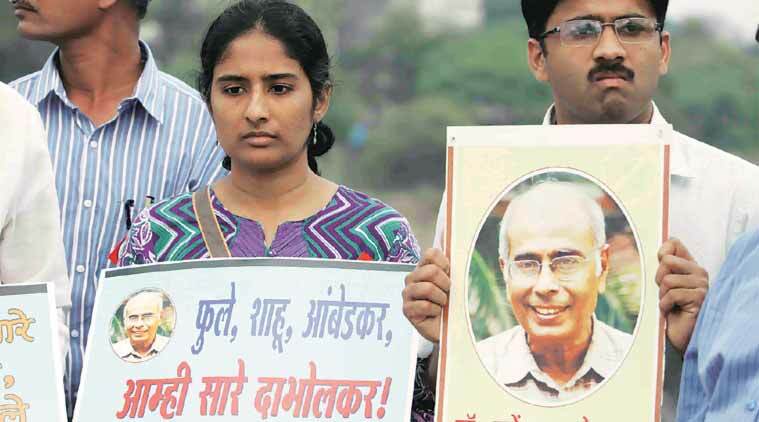 The Dabholkar family said the recent arrest of a suspect in connection with the Pansare murder has “once again bared the face of those who propagate and indulge in violence especially against individual crusaders”. The family of rationalist Narendra Dabholkar Sunday expressed disappointment with the Centre and the Maharashtra government over lack of any “concrete response” following the recent arrest of a suspect associated with the Sanatan Sanstha in connection with the murder of Communist leader Govind Pansare. “Why is Home Minister Rajnath Singh and Maharashtra Chief Minister Devendra Fadnavis silent vis-à-vis their stand on organisations that propagate and indulge in violence against crusaders?” asked Hamid Dabholkar, son of the anti-superstition activist, who was murdered in Pune on August 20, 2013. The family, however, continues to avoid mentioning Sanatan Sanstha, which has also been under the lens for the murder Dabholkar. “What is disappointing is the response from the both the state and Central government, who seem to be watching but refuse to say anything. We are sorely disappointed and unable to understand their silence,” Hamid told The Indian Express. Asked whether the family was pressing for a ban on organisations like Sanatan Sanstha, daughter of the slain activist Mutka Dabholkar said, “The state government had in 2011 sent a proposal to the Centre for banning organisations that indulge in violence. The government has not acted upon it so far. It is up to the governments to explain their stand,” she said.